How Do I Know If A Sparking Outlet Is Dangerous? Everyone who has plugged in an appliance in their lifetime has seen it – a short burst of blue light, a brief spark that occurs right as the plug and outlet start to connect. But what causes it, and should you be worried about your sparking outlet? 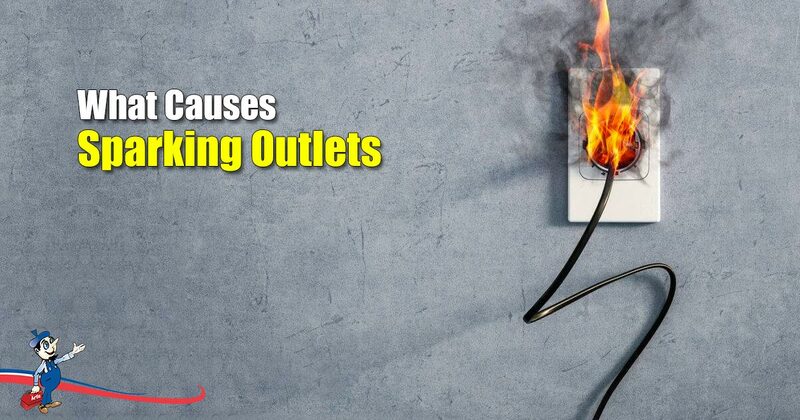 What Makes Outlets Start Sparking? All outlets have the ability to create a spark when an appliance is connected, some sparks are just a lot more dangerous than others. The electrical system in your home is divided into different segments, known as circuits. Electrical current runs through these circuits, which often have one or more outlets where appliances can join into the circuit. Just before a plug touches an outlet, when the two are very close to each other, an electrical current from the circuit will reach across the tiny gap and create a spark. This small, blue spark is normal. What Is An Abnormal Spark? If you catch a whiff of melted plastic or smell smoke after you plug in an appliance, turn off the plug immediately. You may be smelling the start of a fire. A very small spark is normal when connecting a plug to an appliance, so if you are seeing noticeable large sparks that appear to leap out of the plug socket, there is likely an issue that needs to be fixed. A spark should come and go in the blink of an eye. A spark that lasts longer than a second, or takes time to fizzle out is a sign that your outlet or electrical circuit might be faulty. Outlet sparks are blue, and should only be blue. If you notice white or yellow sparks (or any other color, for that matter), there is likely a greater problem at hand. What Causes An Outlet To Spark? There are a few common causes of sparking outlets, so if you notice any of the following issues make sure to contact a licensed electrician to fix the problem. Because your home is divided into different electrical circuits, it is possible to overload one specific circuit. If you have multiple appliances plugged into the circuit that runs your bedroom and none plugged into your kitchen, there is a greater chance of plugs sparking in your bedroom. Try not to overload circuits. Similarly, don’t plug too many appliances into one outlet. Inside a circuit there is a hot, neutral and ground wire. Hot wires are black and provide a circuit with electrical current, while neutral wires are white and provide the electrical current with a return path, effectively creating an electric circuit. Green or bare wires are known as earth or ground wires, and are fail-safe in case something goes wrong. An outlet short-circuit occurs when an outlet becomes loose and the hot wire touches the ground or neutral wire, creating an unimpeded electrical circuit that draws extra current and creates extra heat. This can melt wire sheaths and start a house fire when you attempt to connect a plug. Everyone knows that water and electricity should never mix, so it isn’t surprising that when your pipes spring a leak Art Plumbing, AC & Electric will be sure to check your wiring for short circuits and dangerous electrical damage. Like many household appliances, electrical outlets become worn out over time. Repeated use can result in the contact points inside your old outlets to wear down. This can result in long sparks or arcs of electricity that can be harmful to both you and your home. Always hire a qualified electrician to perform any type of electrical installation or repair. DIYing outlet repair or anything electricity related is dangerous, and hiring an unqualified electrician is potentially dangerous in the long run. How Do I Prevent Bad Sparks? As you now know, all outlets will naturally spark. Preventing unnatural sparks is the ultimate goal, which you can achieve with the help of Art Plumbing, AC & Electric. Installing electrical safety systems is a good way to prevent badly sparking outlets. Always remember that electricity can be deadly, particularly in situations where wires are crossed or electrical current has come into contact with moisture. If you feel one of your outlets is sparking badly, make sure to contact a licensed electrician as soon as possible, and never try to connect a plug to a damaged outlet.